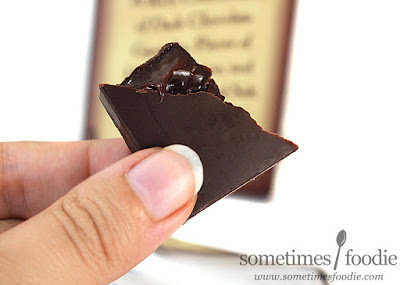 Here's another Trader Joe's chocolate bar that was good enough to revisit. 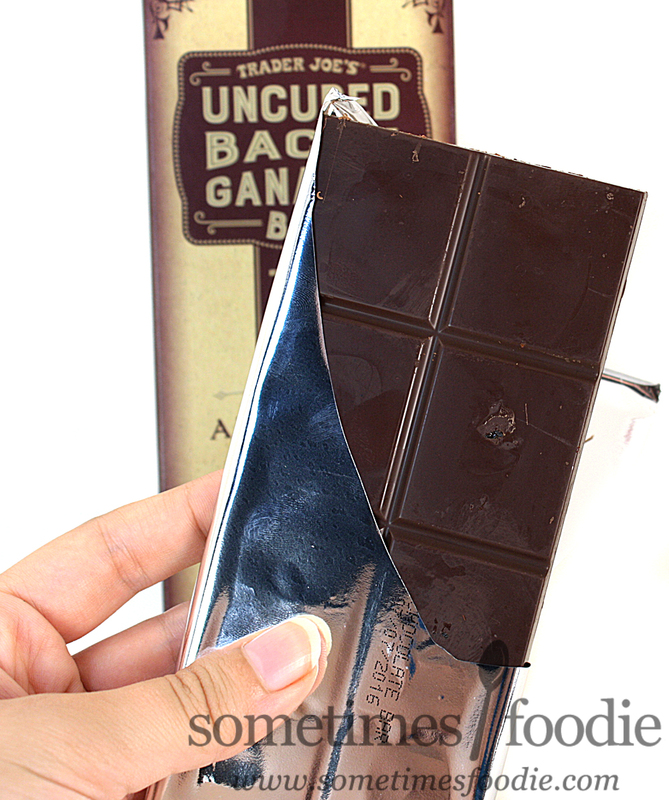 Instead of a popping candy gimmick, this time we have a bar that's filled with bacon ganache! Because everything is better with bacon, right? Actually no, not everything is better with bacon. Trust me. I'm a huge fan of this salty cured meat, and for a while there you could literally buy bacon-flavored everything, which was NOT a good thing. (Fun fact, when my sister and I have a particularly long and hard week of work we get together, I cook an entire packet of bacon, and we eat it all. We occasionally do this with an entire shrimp ring, but more often than not, we reward ourselves for surviving with bacon. Don't judge! Treat yo' self.) Bacon became a novelty, and something as glorious as bacon deserves much better. Thankfully, the people over at Trader Joe's take their bacon seriously, and when they release a bacon-themed product, it's worth checking out. The packaging for this bar is nowhere near as interesting as the Fireworks one. This time instead of a simple plastic heat-sealed pouch, we have a cardboard box with this bizarre wild-west-esque design and faux texturing. I don't even know where to begin with this design. It's just so...lazy looking. I think it's meant to appeal to a no-frills male audience, but the typeface choices here seem so out of place for that overall rugged look that they seem to be going for. I mean this is Trader Joe's, it's target consumers are hipsters, health-conscious families, and foodies. 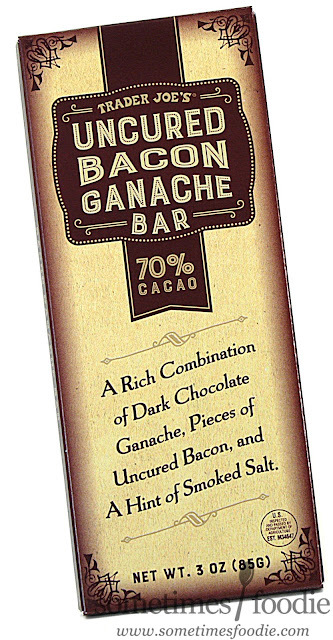 This design doesn't seem like it'd appeal to any of those target demographics on it's looks alone, but everyone loves chocolate, and bacon, so thankfully the product itself is enough to win over the general consumer and get them to add this to their cart, because it's awesome. The bar inside is broken up into large pieces, kind of like the Fireworks bar, and each piece of dark chocolate is filled with a glossy chocolate ganache that's been infused with smokey bacon goodness. This time the outside dark chocolate layer is less sweet than the one from the Fireworks bar, so this one suits my tastes a lot more, and inside that bitter chocolatey square is a thick chocolate ganache that is sweet, salty, a little smokey, and filled with little chunks of actual bacon. We're not talking sad dried out bacon-bits-style "bacon," but real, uncured, chewy, BACON. The pieces are so small they're about the size of sprinkles, but they pack a seriously delicious, and salty, bacon-y punch. I now bacon flavored stuff usually comes across as being silly, or a novelty, but this combination of flavors really works, and I think any bacon-lover out there (who appreciates dark chocolate) would absolutely love this bar. If you're looking for the perfect valentine's day treat for the bacon-loving carnivore in your life, I'd grab a pack of this, and some Trader Joe's Sweet Sriracha Uncured Bacon Jerky, and call it a day. (Maybe add a bacon-themed card and a pack of real bacon or something too. It is Valentine's Day after all. Show your love with salted cured meats and meat-based goods!) I, on the other hand, am dating a vegetarian, so instead of buying these for him, I'll be buying all three for myself.